A friend of mine sent me this. I thought it was great so I would share it. Apparently, Despair.com is now selling shirts with this on it. If I were still in school and wore stuff like this, I would totally get one, but I'm not sure it would be real appropriate for work. 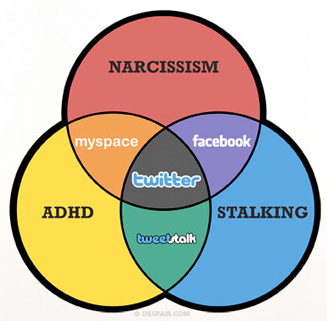 In any case, this seems to sum up the whole FaceBook, Twitter, MySpace non-sense quite nicely. This page took 0.781 seconds to load.